Topic of receptors is also of prime importance while preparing for the GPAT exam. Every year, you will find 1-2 questions from this section. Most of the student neglect this topic as it is one of the least taught topics in the classes. Here I am discussing this topic in detail to have you a comprehensive understanding of the topic. It was Paul ehlrich who coined the term receptor. The molecules which have affinity for the receptors and have intrinsic activity or efficacy are termed as agonists. On the other hand, molecules which lack intrinsic activity/efficacy but do possess affinity are called antagonists. Inverse agonists neither has a typical agonist activity nor of a typical antagonist. 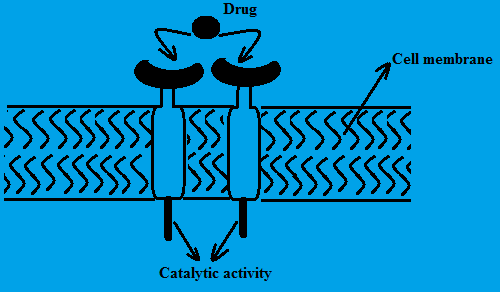 It produces the activity totally opposite of agonist. Together, agonist, antagonist and inverse agonists are called ligands (Compounds having affinity to the receptors). a) Ligand gated ion channels- These are the receptors which produce most rapid response. 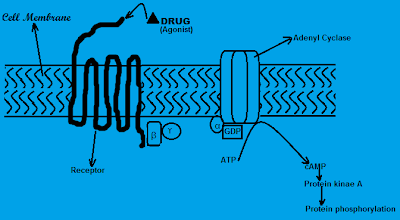 Examples of ligand gated ion channels include- Nicotinic receptors (Ach), GABA, Glycine and Glutamate. Let us study these receptors with the example of Ach on nicotinic receptors. Nicotinic receptors are consist of 5 subunits – 2 α and 3 different combination of α,β,ϒ and δ subunits. First Ach binds to 2 α subunits which brings out the conformational change in ligand gate. This result in the opening of the receptor from the centre and entry of Na+ in ECF occurs. This ultimately results in the depolarization of surrounding plasma protein and ultimately the response. b) Voltage gated & 2nd messenger gated ion channels- Most common example of voltage gated channels include the Na+ channels responsible for impulse conduction in sensory nerve fibres that transmit information about pain and temperature (protonated lidocaine blocks the Na+ channels from ICF). Ca2+ and K+ pumps or channels are example of 2nd messenger. GPCR induce their signals via activation of intracellular guanine nucleotide binding protein. Family of receptors has seven hydrophobic (hepathelical) domains. The extracellular region is composed of amino terminus and which comprise the ligand binding site. The carboxy end of the receptor is located in the area of the protein that protrudes into the cytoplasm. The intracellular end also contains the G-protein binding site. Close to the carboxy terminus, serine & threonine residues are also present which are responsible for ATP dependent phosphorylation. Following long activation of the receptors, phosphorylation of these areas occurs and results in the inactivation of the receptors. There are more than one GPCR for a single ligand. e.g. Noradrenaline has 9 different adrenergic receptors. i) Gs proteins- Stimulates adenyl cyclase activity & Ca2+ channels. ii) Gi proteins- Decrease adenyl cyclase & increase K+ channels. iii) Gq proteins- Increase phospholipase C activity. iv) G12 proteins- Modulate Na+/H+ ion exchanger. After the binding of ligand, GPCR activates and which results in the conformational change in linked G protein. This result in the release of GDP associated with α subunit of G protein. 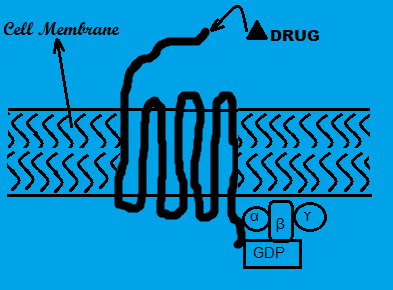 GDP is replaced by the GTP and α-GTP complex is formed and dissociated from the αβ subunit which ultimately binds to target enzyme. This results in activation/inhibition of the target enzyme. Within the short duration of time, α subunit catalyse the dephosphorylation of GTP to GDP and reassociation of α subunit with αβ subunit occurs and this ultimately results in the inactivation of G protein. Only variation to this scheme is the activation of G protein gated channels by αβ subunits. Second messenger pathway of GPCR. Magnitude of the response is directly proportional to the concentration of cAMP. Degradation of cAMP is done by the phosphodiesterase or by active transport out of the cell. Similar pathway is for the cGMP (ANF & NO). 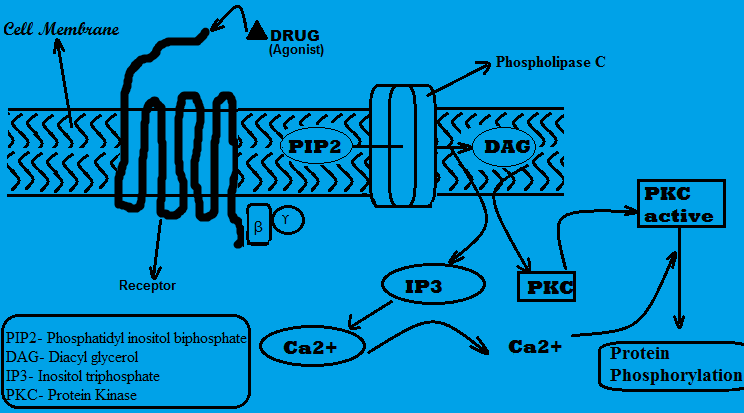 One effect of this pathway is relaxation of smooth muscles by dephosphorylation of myosin light kinase. Mainly peptide hormones including Insulin, EGF, PDGF & ANF acts through this pathway. Extracellular portion is for ligand binding while intracellular portion of the receptor possess enzymatic activity (kinase activity). These receptors are similar to the catalytic receptors except their intracellular portion don’t have enzymatic activity instead they have combine with other enzyme. Examples include cytokines, erythropoietin & interferrons. Enzymes linked are bound enzymes of Janus kinase family (JAK). 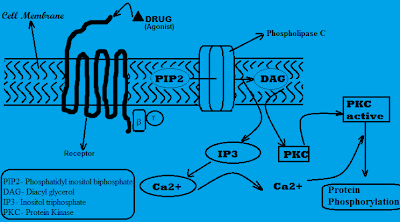 JAK phosphorlylates ligand bound receptors. 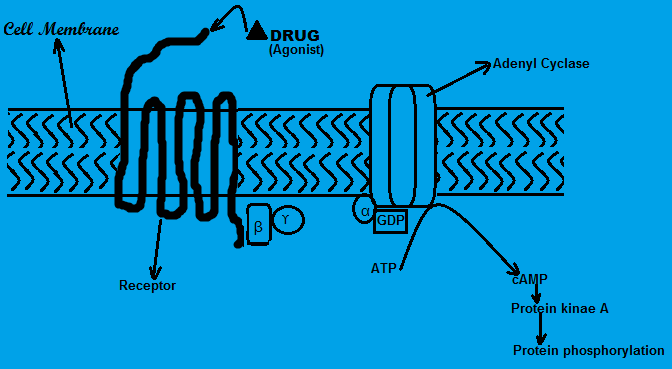 The phosphorylated receptors then bind other molecules called signal transducers & activators of transcriptions (STATs). STATs are also phosphorylated by JAKs & dissociated into cytoplasm. STATs from cytoplasm enters nucleus and results in the gene transcription. Receptors are present in cytoplasm or at nucleus membrane. 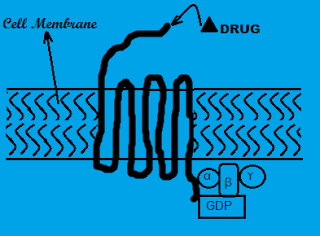 Receptors activated only by lipid soluble ligands that can diffuse cell membrane. Examples include steroid hormones, Vitamin K and NO. Carboxy terminus of the receptor binds with ligand whereas amino terminus is the site for heat shock protein-90.